Two of the best burger joints in the world are right here in the Roaring Fork Valley: Fatbelly Burger in Carbondale and Grind in Glenwood Springs. Both serve a unique style of burger, but each uses the best, freshest locally raised Crystal River Beef. Fatbelly was created around a simple plan and a simple menu: burgers, grilled cheese, fries, and a standout veggie burger for those who don’t dig beef. The Standard burger, made with a pressed beef patty cooked at 500 degrees to ensure a dark brown exterior and juicy flavor, is a customer favorite. Add cheese, “secret sauce” (not unlike Thousand Island dressing), iceberg lettuce for crunch, ripe tomatoes for acid, pickles for a vinegar kick, and grilled onions and you have a burger that locals will (and most often do) stand in line for. Down at Grind on 7th Street in Glenwood Springs, owners Chris Heinz and Mike Mercatoris actually grind their own beef, buffalo, lamb, pork, chicken, and veggie patties. (Butternut squash burger, anyone?) Look for the Grind of the Day, a custom patty with unconventional toppings. One such daily favorite is the 3 Little Pigs, a pork grind of ham and bacon, topped with onion rings, cheddar, barbecue, and ranch. 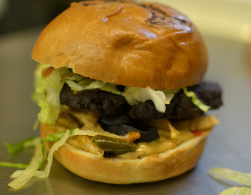 Our favorite, however, is The Mayan, a house-made black bean burger with chipotle mayo, pumpkin seed salsa, and lettuce. Spicy, creamy, and cool. It’s a one of a kind. When Chris Heinz and Mike Mercatoris opened Grind last year, their mission was simple: “We wanted to get a little healthier and be a little more sustainable in a way that was still accessible,” says Heinz, a South Dakota native. At their restaurant (named for in-house meat grinding, not for filing edges or riding rails), Heinz brings a chef’s eye to the kitchen and an appreciation of quality to the table. Despite some cutting-edge creations on the menu, the classic All-American burger—a beef patty with American cheese, lettuce, tomato, pickle, red onion, ketchup, mustard, and mayo—is the most popular sandwich. Other coveted plates include Richie’s Lunch (a beef patty topped with bacon, caramelized onions, smoked provolone, lettuce, and gremolata mayo) and South by Southwest (a bison burger with melted Havarti, avocado, pico de gallo, jalapeño, lettuce, and chipotle mayo). Slow to catch on since Grind’s 2011 opening, lamb burgers now pull in locals and tourists alike. “Te Medi [lamb burger] has a reputation now,” Heinz says. In fact, he eats this sandwich—garnished with roasted-red pepper- and-feta spread, tzatziki, marinated tomatoes, lettuce, and red onions—several times a week. Don’t forget the fries. Grind’s hand-cut russets can stand alone. (Hint: A to-go order makes the last 40 miles from Denver to Aspen’s mountains extra delectable.) Try them with one of Grind’s homemade dipping sauces, like the zippy green-curry mayo. With good business, Grind may expand into a vacant space next door. That’s great news for diners who might actually want to sit down: Te 24 seats inside Grind plus a select few on the patio are hot commodities. But Grind isn’t the only popular burger joint dishing up deluxe burgers for hungry mountain goers. Dig into these four burger joints (with relish). On The Road Again Check out the fall colors—and remain fueled in the process. The drive from Denver into the mountains on a sunny fall day is, in itself, spectacular. But leaving the city isn’t just a chance to escape into the gold and green wilderness, it’s an opportunity to discover dining locales that have yet to make it onto your GPS. The secret to Grind’s signature burger? The custom blend of locally raised, grass-fed beef that comes from Crystal River Meats, located just up-valley from the restaurant. Cuts of brisket, short rib, and chuck are ground into patties on the premises. 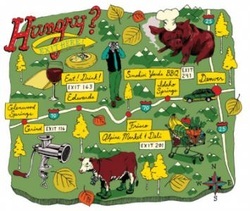 This is a burger joint for the food obsessed, and it’s worth a trip in any season. Order This: The Daily Grind, a changing chef-inspired creation, ground from beef, chicken, lamb, fish, pork, buffalo, or veggies. Current hours: 11 a.m. to 10 p.m., Monday through Saturday, 11 - 8 pm Sunday. But that's what he got when he hired Chris Heinz at Zheng Asian Bistro, the Glenwood Springs restaurant that Mercatoris co-owns with chef Ming “Henry” Zheng. Instead of letting that kind of talent get away, Mercatoris and Zheng decided to help Heinz realize his dream of running his own restaurant one day. After working as manager of Zheng's Glenwood Meadows location for the past several years, Heinz is now the brainchild behind one of Glenwood Springs' hottest new lunchtime and evening eateries, the Grind gourmet burger restaurant on Seventh Street. “One of our main goals is to work with people who want to stay in the business, and help them grow,” said Mercatoris, who partnered up with Heinz to open Grind. “We want to create opportunities by using our background and experience to help people do what they love, and do it where they live,” he said. That homegrown model is what Grind is all about as well. The name literally means the restaurant grinds its own locally-grown beef and other meats in-house daily. The beef and lamb comes from Crystal River Meats in Carbondale, which is grass-fed and free of antibiotics and hormones. Buffalo meat, chicken and pork used at the Grind is also produced in Colorado and around the Rocky Mountain region. Heinz, 32, completed culinary school in Oregon, and his resume includes a stint at Portland's famous Noble Rot Wine Bar restaurant. Indeed, Heinz admits he tries to have fun with it. In addition to standards like the All-American and Richie's Lunch (named for co-chef Richie Green) hamburgers, BBQ pork sandwich and buffalo burgers, Grind features the Medi and Tandoori lamb burgers, a Chicken Cordon Bleu and ahi tuna sandwiches. Customers can also build their own sandwiches from a long menu of choices, including more than 25 toppings and 22 different sauces. There's also a daily special, such as Thursday's Drunken Buffalo with beer-battered onion rings and a sweet-and-sour chicken sandwich that built on a Zheng favorite. “It was all the flavors in Zheng's sweet-and-sour chicken, in a bun,” said Mercatoris, who has been with Zheng for 18 years, including several years at the Mountain Dragon in Snowmass Village. They opened the original Zheng location in El Jebel nine years ago, and the Glenwood restaurant five years ago. The local theme at the Grind extends to the interior look, which was designed by local artists. The table tops are even made of salvaged beetle kill from Vail. “The nice thing about the partnership is that a lot of what Chris does here carries over to Zheng,” Mercatoris said. For instance, Zheng has also started using local beef, he said. “It's a great way to try something on a smaller scale first,” he said. 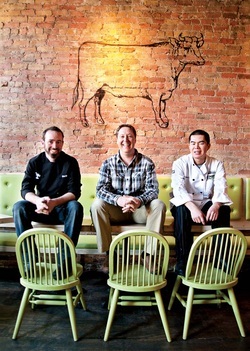 Grind currently employs a staff of about 10, including two other trained chefs besides Heinz, Green and Chantal Popick. For now, the regular hours are 11 a.m. until 7 p.m., Monday through Saturday. “We're hoping to start staying open until 9 next week, and maybe do some family-night things,” Heinz said. Future plans also include outdoor seating once the new parking lot and alleyway work to the west and behind the building are finished.